A Paradox or a Path to Consider? In 2008, Dr. Brent Smith, Associate Professor of Marketing and Arrupe Center Fellow, first developed and taught the course “Ethics in Marketing.” At the time, it was literally one of few marketing courses in the country whose entire content was devoted explicitly to ethics. As a starting point, Smith challenged marketing students to deal with the public critiques of their chosen discipline. This challenge is intended to encourage some self-reflection and self-examination. Smith says, “These activities speak to certain Jesuit ideals that should help distinguish Saint Joseph’s students from others.” Many people find the term “marketing ethics” to be a paradox. However, faculty must urge marketing students to think carefully about that opinion. Do they agree with it? Is it fair? What kind of marketers do they want to be? The students are also charged with considerable reading to prepare themselves for spirited discussion and debate. This includes books, chapters, and articles by some highly respected business and marketing ethicists, such as George Brenkert, John McCall, Joseph DesJardins, Laura Hartman, Shelby Hunt, Scott Vitell, Linda Ferrell, and O.C. Ferrell. 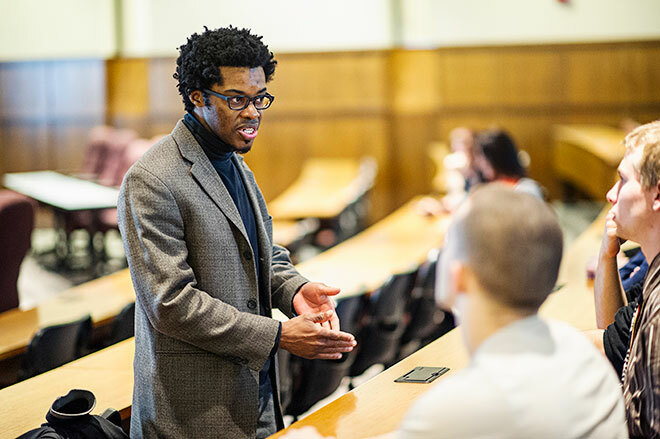 Believing in diversity-infused education, Dr. Smith also introduces students to African proverbs and important ideas from Catholic Social Teaching, Sun Tzu, Plato, Aristotle, and Adam Smith. In keeping with these ideas, the students spend considerable time discussing formative topics. For example, they talk about whether marketing has room for things like cura personalis and “being men and women with and for others.” “Given our institutional identity and brand, I have found that these discussions can really help students see the marketplace as a vehicle to create value for the world and humanity,” says Smith. Then, assignments and conversations about brand social responsibility or people, planet, and profit make more sense for students. Ethics is not an add-on, but a common thread in every aspect of the learning experience. Smith also taps into the liberal arts curriculum required for all business students, encouraging them to consider why ethics, economics, and politics fundamentally inform business for the common good. In that vein, Smith teaches his own simple four-step approach — AISA — to help businesspeople stay in touch with the common good. It stands for Awareness → Interest → Sensitivity → Advocacy. The students really appreciate AISA because it makes the formal ethical theories readily accessible. It gets students talking about the ethical principals and hopefully applying them even if they cannot recall the formal theories. It drives them to think carefully and creatively about stakeholders affecting or affected by marketing activities. Students have applied AISA to analyzing and recommending prescriptions for questionable sports fan behaviors, gender depictions in entertainment, credit card promotions, and even human trafficking. In actuality, AISA helps Saint Joseph’s students make room for reflection and cura personalis in their basic toolkit next to marketing core principles of product, price, promotion, and place.